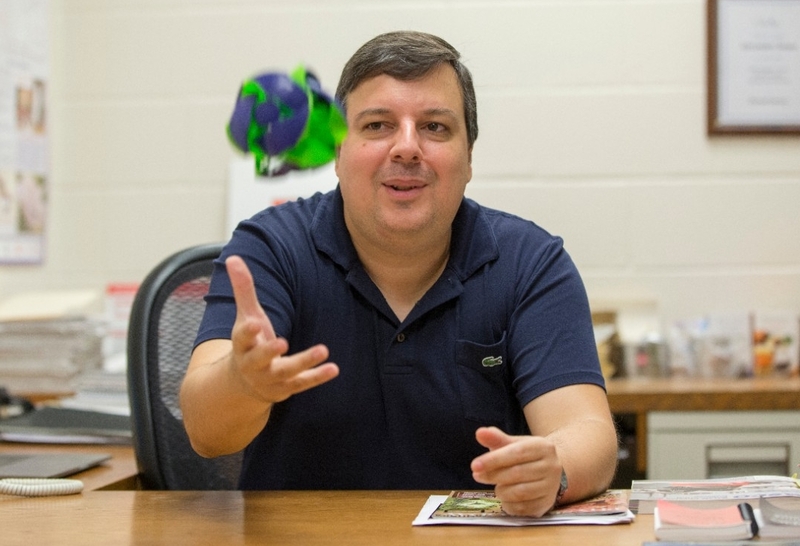 University of Cincinnati physicist Alexandre Sousa harnessed the collective power of 1 million computer processors to crunch data from his latest experiment at the Fermi National Accelerator Laboratory. The experiment produced results ridiculously fast compared to previous experiments. How fast? Instead of taking an estimated five months using past methods, the latest analysis took a little more than two days. The results could influence the way scientists study high-energy physics in the future. “It’s the first time a neutrino experiment used 1 million computer processors working simultaneously,” Sousa said. UC partnered with three other labs for the study, which used a supercomputer named Cori to process 37 million CPU hours’ worth of data in just 54 hours. 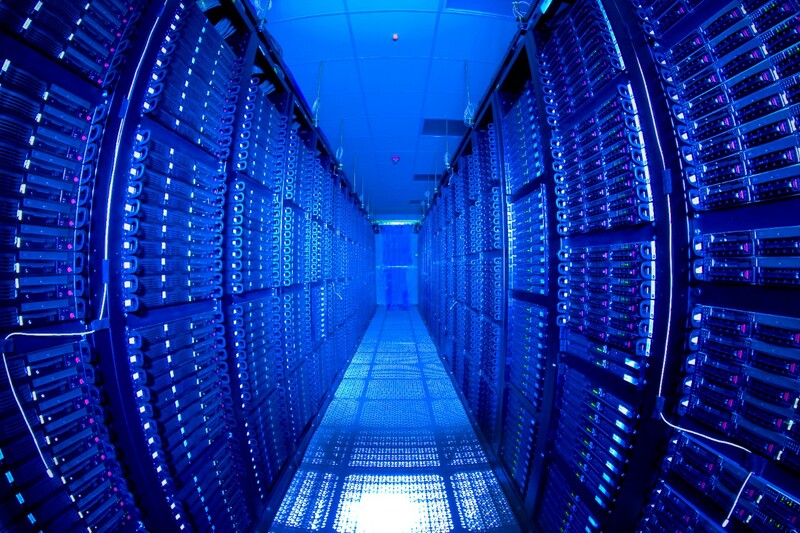 Cori can process 1.7 terabytes of data every second. To put that in perspective, Fermilab says conducting the same analysis on your computer would take about 4,000 years. 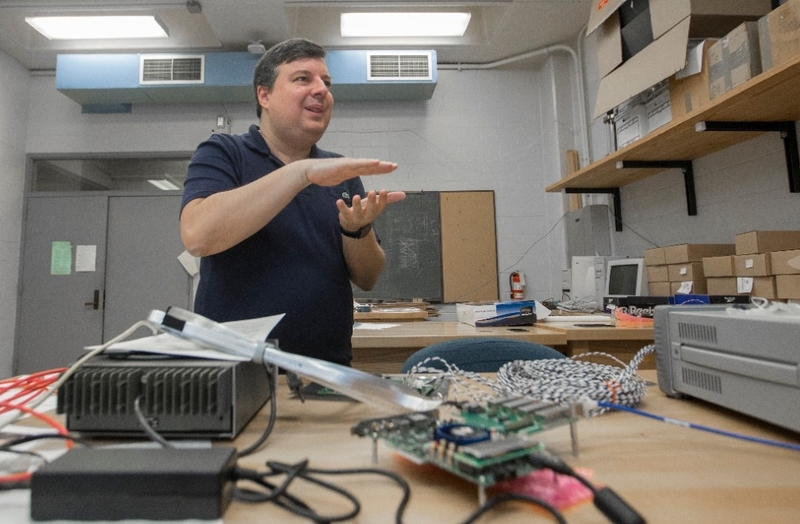 “This is the culmination of more than a decade of research and development we have done at Fermilab,” Panagiotis Spentzouris, head of the Fermilab’s scientific computing division, said in a statement. 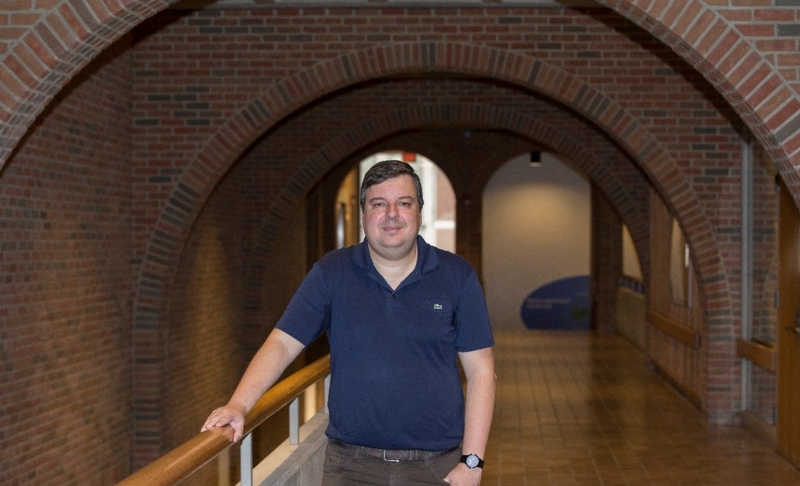 Sousa, an associate professor of physics in UC’s McMicken College of Arts and Sciences, is studying neutrinos, the tiniest particles in the known universe. They’re so small they pass through anything, including you right now, at the rate of about 600 trillion per second. Created in the sun, the Earth’s atmosphere and its crust, they zip through the universe at the speed of light — nearly massless objects on a collisionless course through eternity. Fermilab’s analysis allowed physicists to take a closer look than ever before at neutrino interactions. 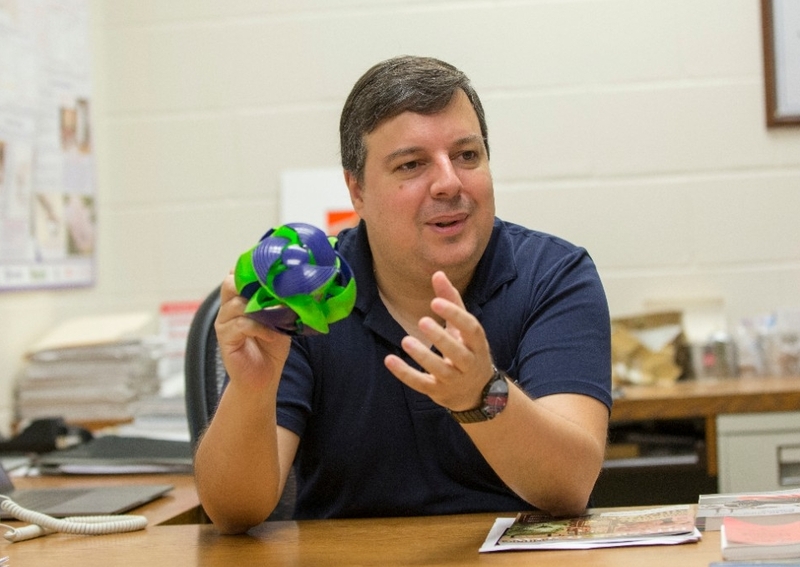 At Fermilab, Sousa is collaborating on three experiments, including one called NOvA that involves scientists from 50 universities spread across six countries. 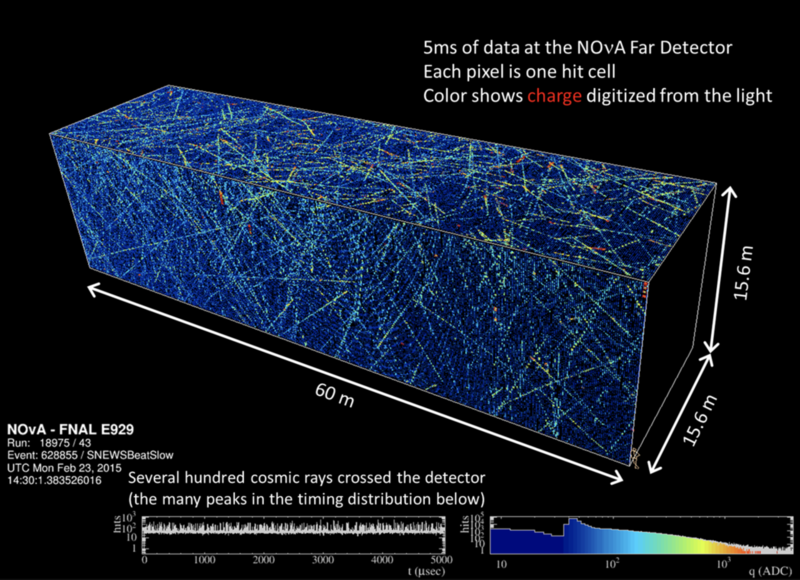 NOvA is funded by a U.S. Department of Energy grant called Science Discovery through Advanced Computing. Researchers put to work America’s largest computer server farms to analyze data from the neutrino experiments. If we were to find this particle, we would have to rewrite the standard model of particle physics. It would be very exciting. Fermilab’s particle accelerator generates billions of neutrinos that rocket through the Earth each second at nearly the speed of light. Occasionally, a neutrino will collide with an atomic nucleus, creating a cascade of charged particles like a shooting star streaking across a dark sky. NOvA detectors are waiting to record them. One is smallish detector a half-mile from the beam source in Illinois. A second, more massive detector was built 550 miles away in northern Minnesota. The Minnesota detector is the largest plastic structure the world has ever seen at 200 feet in length and 15,000 tons. It’s full of mineral oil and chemicals that produce light from the charged particles that can be observed and recorded. The detectors’ goals are to sort through the noise of all the naturally occurring cosmic rays to isolate the interactions of neutrinos fired by Fermilab’s accelerator using factors such as direction, energy and estimated time of arrival. Still, Fermilab says it’s like trying to find one person in the entire Western Hemisphere. On sabbatical at Fermilab, Sousa is studying the three known types or flavors of neutrino: muon, electron and tau. But Sousa and other physicists are looking for a suspected fourth neutrino called a “sterile neutrino” that interacts only with gravity. “If we were to find this particle, we would have to rewrite the standard model of particle physics. It would be very exciting,” Sousa said. The interesting thing about neutrinos is that they rocket through space in a state of quantum entanglement, neither fully one kind of particle or the other but “oscillating” or changing back and forth. The detectors record these oscillations, which could help physicists unravel the mystery of why the world is full of matter — stars and planets and Dalmatian puppies — but so little antimatter. “We have reason to believe that when the Big Bang occurred, equal amounts of matter and antimatter were created. If that is true, all of that matter and all of the antimatter would annihilate and all that would be left is radiation,” Sousa said. “We wouldn’t be here to talk about it because there would only be radiation. Studying neutrinos is tricky. Sousa said it’s difficult to tell whether the neutrino and antineutrino oscillations NOvA observes are actually an indication of particle-antiparticle asymmetry that is responsible for matter’s dominance in the universe. Or perhaps it’s just the background effect of neutrinos and antineutrinos traveling through the Earth. Physicists call the potential difference between neutrino and antineutrino oscillations “C-P violation,” which might explain matter’s dominance over antimatter in the universe. “We can measure neutrinos and antineutrinos and think we’re observing C-P violation but because there are also matter effects from the Earth, we may be confusing the two phenomena,” Sousa said. UC partnered with Fermilab, Colorado State University, the Lawrence Berkeley National Laboratory and Argonne National Laboratory on the project. Now Sousa is getting ready for Fermilab’s new Deep Underground Neutrino Experiment, or DUNE. A distant detector for this experiment is being built 800 miles away from Fermilab in a former gold mine about a mile underground in South Dakota. DUNE represents the largest high-energy physics experiment ever created in the United States and includes more than 1,100 scientists from 32 countries. “Since DUNE is much farther away from the beam, the matter effects are large enough that we should be able to disambiguate the effects from C-P violation. 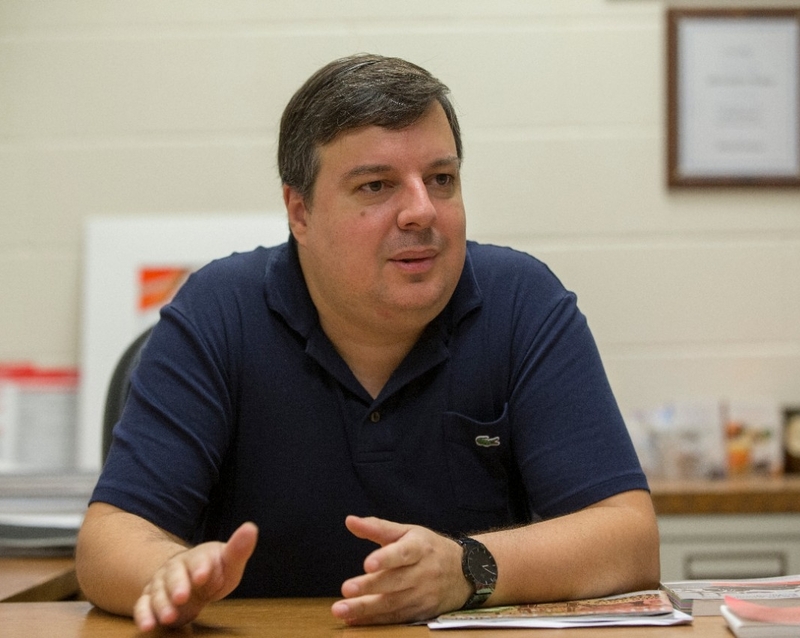 We can tell if it’s really the new physics we’re looking for,” Sousa said. This detector, actually a group of four, is massive and will hold 68,000 tons of liquid argon kept at a brisk -299 degrees Fahrenheit. Its claim to fame: it will have the highest spatial resolution of any neutrino detector, which means scientists can study them with even more precision. Sousa is working on new circuit boards the size of tablet computers to record neutrinos in the new detectors. Two of the detectors will use as many as 3,000 of these circuit boards to record the neutrinos. But first Sousa and his colleagues will have to make sure the electronics can operate in subfreezing temperatures. He is testing electronics in his UC lab using liquid nitrogen as a stand-in for argon. The new electronics are another example of how high-energy physics has spurred technology such as the creation of the world wide web. Fermilab’s research has contributed to medical insights into proton therapy and diagnostic equipment such as magnetic resonance imaging and positron emission tomography, or PET scans. “This microchip was created specifically for the DUNE experiment,” Sousa said, holding up the circuit board. “I think this is where these experiments really contribute to society. We are answering questions about the universe. At the same time, we’re developing new, state-of-the-art electronics that eventually can trickle down to the consumer level. Do you like physics? Study and conduct research with some of the world's most renowned professors in UC's Department of Physics or explore other programs at the undergraduate or graduate level.